How will the pace of uptake of autonomous vehicles by ride-hailing fleets affect the growth of the sector in the coming decades? Mobility as a service (MaaS) — including ride-hailing and car-sharing — has become a pillar of transportation in numerous cities, increasing access to and ease of making door-to-door trips in a vehicle, often at a lower cost than taking a taxi and with greater predictability. Thus, it is not surprising that the industry has grown rapidly around the world. 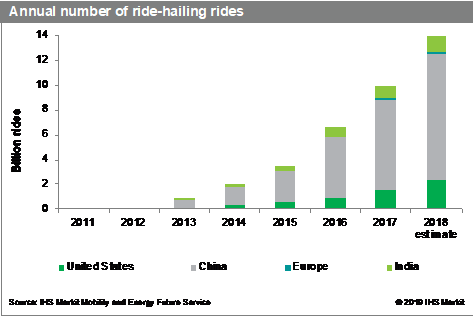 IHS Markit estimates that the number of ride-hailing trips in the four key markets of China, Europe, India, and the United States surged from about 1 billion in 2013 to an estimated 14 billion in 2018 (see chart). We expect that this industry — $100 billion in 2018 — will be over $1 trillion by 2040. The rapid growth of ride-hailing, however, has given rise to issues about traffic congestion, jobs and wages, public transportation funding, rider safety, and pollution. These concerns, in turn, have attracted the scrutiny of regulators — a phenomenon that is likely to continue. Greater congestion in central areas. Ride-hailing may be adding to congestion in urban areas during certain times. Taxi driver job losses. In some cities, ride-hailing vehicles may not only be expanding driver-for-hire services but may also be displacing traditional taxis. Although taxi drivers can become ride-hailing drivers, there are instances where taxi drivers have invested large amounts of money and/or time to become drivers, such as in London, where they often spend multiple years studying to pass a test, known as “The Knowledge.” In New York, the declining value of taxi medallions can undermine drivers’ retirements. Passengers — and funds — drawn away from public transport. Some people are opting to use ride-hailing services instead of public transport. This shift reduces public transport ridership and revenue and can lead to a vicious circle whereby less funding spurs a degradation of service, which in turn spurs further ridership declines. To be sure, ride-hailing can be complementary to public transport, but concerns about these impacts loom large for some stakeholders. Capping the number of ride-hailing vehicles. As but one example, in August 2018, New York City imposed a temporary one-year cap on the number of ride-hailing vehicle licenses. That same month, London Mayor Sadiq Khan floated the idea of a similar restriction. Taxing ride-hailing trips. Chicago, Massachusetts, New Jersey, Philadelphia, and Washington, D.C. are among the jurisdictions that have imposed taxes on ride-hailing trips. Applying congestion pricing, including — but not only — on ride-hailing vehicles. Taxing trips of vehicles into central areas — particularly at peak times — could lead to greater use of public transport and ride-pooling within these areas by discouraging single-passenger vehicle use. Singapore, London, and Stockholm are cities that have congestion charges in place. Today, there is a “spectrum of permissibility” of ride-hailing in jurisdictions around the world. For example, policies toward ride-hailing are generally more permissive in the United States than in Europe, where the practice has been much slower to take off, in part because of regulations in a number of countries that require drivers to be commercially certified. In China — the largest ride-hailing market as measured by the number of rides — the regulatory landscape has been evolving, and passenger safety has recently been a particular concern. To be sure, ride-hailing regulations can vary from city to city within the same country. The stringency of regulation is shaped by local conditions, in particular the relative power of taxi drivers and public transport advocates and the robustness of a city’s public transport system. Cities with more entrenched “legacy” transport interest groups and more robust public transport systems are likely to be less permissive of ride-hailing, all else being equal, than cities with less powerful legacy transport interests and less robust public transit — and vice versa. Looking ahead, a “triangle of interests” will help shape the evolution of ride-hailing policies. Policymakers, ride-hailing companies and riders, and legacy transport interest groups form the three sides of this triangle. Ride-hailing companies have mobilized their customers to protest proposed restrictions on ride-hailing, to varying effect. These firms are likely to continue using this approach, and it could become more effective as their passenger bases grow. We anticipate that MaaS will generally grow faster in more permissive jurisdictions than less permissive ones — as has been the case thus far. Besides the stringency of regulation, the pace of uptake of autonomous vehicles by ride-hailing fleets will also significantly affect the growth of the sector in the coming decades. The prize is potentially huge. Jeff Meyer is a Director of Energy and Mobility at IHS Markit; Tom De Vleesschauwer is a Senior Director of Transport and Mobility at IHS Markit; Elena Pravettoni is a Senior Economist of Mobility and Energy at IHS Markit; and Nigel Griffiths is Chief Automotive Economist at IHS Markit.